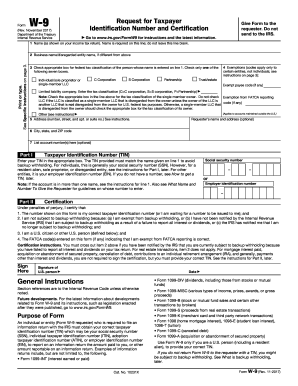 Irs Ptin Renewal is not the form you're looking for?Search for another form here. Who must file the Form W-12? Anyone who is a paid tax return preparer must apply for and receive a preparer tax identification number (PTIN). EAs also must obtain a PTIN. The PTIN must be renewed annually. For purposes of determining who must obtain a PTIN, a tax return preparer is any individual who is compensated for preparing, or assisting in the preparation of, all or substantially all of a tax return or claim for refund of tax. What is the purpose of the Form W-12? 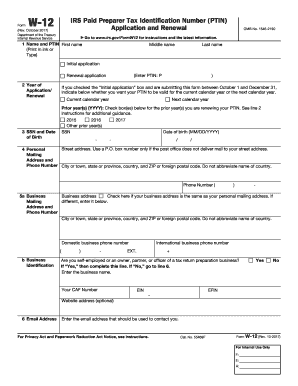 Use this form to apply for or renew a PTIN. What documents must accompany the Form W-12 form? then you must submit a paper PTIN application along with two identity verification documents. (a) Passport/Passport Card, (b) Driver's License, (c) U.S. State ID Card, (d) Military ID Card, or (e) National ID Card. How do I file the Form W-12? Online. Go to the webpage www.irs.gov/ptin for information. 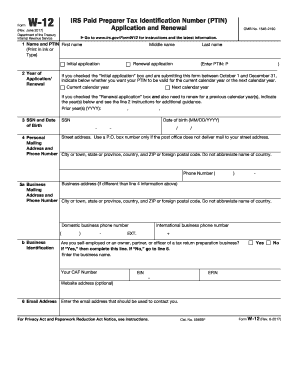 Follow the instructions to submit Form W-12 and pay the fee. If you submit your application online, your PTIN generally will be provided to you immediately after you complete the application and pay the required fee. Allow 4 to 6 weeks for processing of paper Forms W-12. Jan 1, 2016 ... The fee is $50.00. View this checklist to get started. It only takes about 15 minutes to apply for or renew your PTIN online. But if you prefer to use the paper option, Form W-12, IRS Paid Preparer Tax Identification Number (PTIN) Application, it will take 4-6 weeks to process. ,..... / GILBERT S. COLOMAAGARAN BENJAMIN J. CAYETANO CHAIRPERSON GOVERNOR OF HAWAII BRUCE S. ANDERSON MEREDITH J. CHING CLAYTON W. DELA CRUZ BRIAN C.
'. .. ,,; ., r " F /1 ', ' i, ' r) " II ' . . ., " ' ', I, " !J r1! " , : ' " ") I I ' .. :, ' , , . ... " ' "